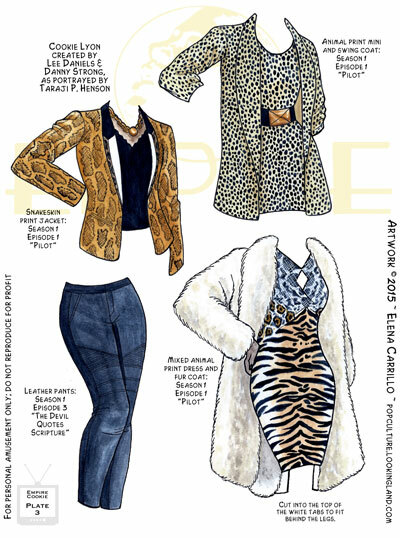 I loved the challenge of doing all these animal prints for Cookie (she wore so many in the first season of the show!). With good references, it wasn’t difficult, but it was, at times, pretty intense (even tedious). All those little spots on that swing coat and dress combo took me forever, if I recollect correctly. Even so it was a lot of fun. I learned how to make convincing “skins” even if they weren’t perfect. At the time I was looking forward to making a bunch of mix and match pieces, but unfortunately I only have one more plate. I’m sorry I didn’t keep up with this. It’s too hard to go back and try to pick up something you dropped so long ago. Or maybe it’s just me. I guess I’m hoping that my catwalk dolls will fill this gap: a series I can work on regularly without the pressure of a live TV show getting ahead and away from me. These are the kinds of paper doll pieces I really personally enjoy playing with: complex designs but simple shapes. They’re easy to cut out and look fabulous on the doll itself. And that’s also what I’m hoping to have with the new dolls.